‘One – two – three – heave!’ cried the admiral, and the table was slid back in place. He gazed down on its polished surface happily, observed there wasn’t a single irreperable scratch, and then his smile faded like a powder disolving in a glass. A red flush spread up his neck and across his face, and he swayed on his feet as he treid to speak. This was all he got out before he pitched headfirst onto the table, his great bulk making it resound like an enormous drum. It is Lady Truthful Newington’s eighteenth birthday and, at a small family gathering, her father is keen to show off the Newington Emerald which will one day be hers. The night goes well until a sudden storm hits the house and, in the chaos that follows, the emerald disappears. As her father lies ill, Truthful decides she must travel to London and attempt to recover the heirloom. Soon, Truthful is balancing twin roles – that of herself, and that of her alter-ego, a young Frenchman. Disgused as a man she can take risks and gain entry to places she never could as a young man. But there are many dangers, not the least of which is discovery.Then there is the risk of falling in love. Truthful must stay safe and focussed if she is to find the Emerald and save her father’s life. Newt’s Emerald is a treat. In the style of a Regency Romance, the fantasy blends mystery, romance and intrigue, with the addition of magic and sorcery for an absorbing, satisfying whole. Fans of Nix’s work will find this a little different – but still with the quality we’ve come to expect. 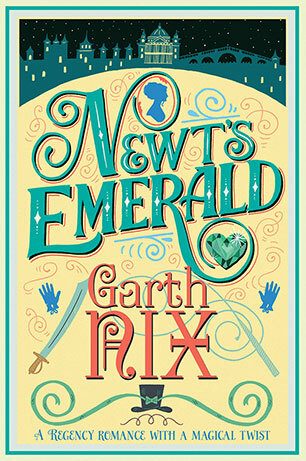 Lovers of regency romances such as those of Georgette Heyer will also enjoy Newt’s Emerald.